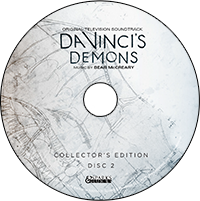 I am proud to announce the second physical CD release for Sparks & Shadows: “Da Vinci’s Demons” Original Television Soundtrack, Collector’s Edition. The two-disc limited edition album is available starting TOMORROW, OCTOBER 22, through Amazon.com and other digital retailers. The first 360 orders through La-La Land Records’ website will get an AUTOGRAPHED BOOKLET! These exclusive signed copies go on sale at noon PST and usually sell out very quickly, so be ready to move fast to snag yours. As I wrote in my mission statement when I founded Sparks & Shadows, I still believe in the physical format as a way for collectors and fans to treasure soundtracks. 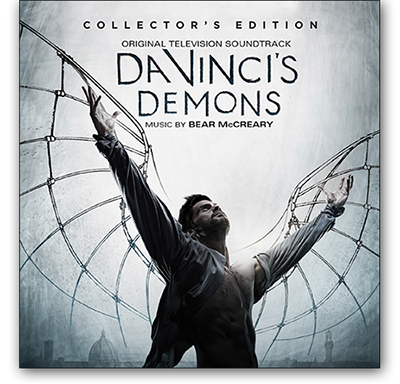 Our initial focus for “Da Vinci’s Demons” was in getting a digital album released quickly, so fans could download the music while they were still watching the first season on the air. I always knew I wanted to go back to this material and release it in a physical format. The digital album is a lean 90-minute record that highlights all the major themes, perfect for the fan who wants a taste of everything. For the CD release, I expanded on the ideas presented in the digital album. There are nearly 40 minutes of new material on this album, and not a second of it is filler. There are no alternate takes or remixes here. Every new track has something to offer. “The House of Medici” marks the first album appearance of the Medici Theme, originally composed by Isaac in the fifteenth century. “The Prisoner,” “Cluster Bombard” and “Camera Obscura” offer propulsive rhythmic motors and developments of important themes. “A Deep Vision” is a horrifying soundscape, built from atonal clusters and backwards samples of score snippets. “Acquittal” features a gorgeous re-harmonization of Lucrezia’s Theme that takes the melody to a new serenity. I believe these tracks are worthy additions to the library of any soundtrack fan and I’m thrilled that they are now available. 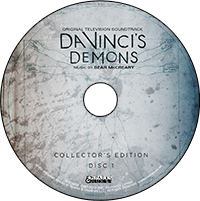 The “Da Vinci’s Demons” CD also features a beautiful booklet and liner notes from showrunner David S. Goyer and stars Tom Riley, Blake Ritson and James Faulkner. One other thing that makes the “Da Vinci’s Demons” album unique (aside from containing a Main Theme that won me an Emmy!) is that it is my only television soundtrack to contain all the tracks in chronological order, by episode. While this is probably commonplace for other soundtracks, I’ve historically chosen instead to put the tracks in an ideal listening order. This creates a pastiche that feels like the season arc without being bound to it. In the case of “Da Vinci’s Demons,” I realized the narrative arcs were so strong and the thematic development so clear, that the ideal listening order truly was chronological. The first season of “Da Vinci’s Demons” was an intensely satisfying creative experience, and I’m thrilled my work is now available to fans in this expanded format. Best of all, this album marks only the beginning of my time in this musical universe. I get to return to this world next spring for Season 2! There’s more good stuff coming this week. Tomorrow night, I’ll post my new “Agents of S.H.I.E.L.D.” blog entry and my next video blog, featuring a composer guest star. On Sunday, there’s a new episode of “The Walking Dead” and the Adult Swim debut of “Metalocalypse: The Doomstar Requiem – A Klok Opera,” a new musical for which I served as orchestral producer. Look for a blog entry about that little gem in a few days. PS: Check out the new and improved Sparks & Shadows site!